Blake’s 7 was a ground-breaking science fiction program made by the BBC, first shown in 1978, and running for four years. Its special effects are low-budget and sometimes laughable, but its scripts and characters have born the test of time so well that the series still stands with the best and towers over the rest. With its dark universe and complex, fascinating characters, and its shocking final episode, it captivated me last year (2001) when reruns were shown on local television. It is more than a thousand years in the future, and much of the galaxy is ruled by the Federation, an oppressive regime. Society is rigid, and citizens are graded into at least four levels—Alpha, the highest, down through Delta—though there are also mutoids and bond slaves who are probably not regarded as citizens. The people are controlled by drugs and harshly-enforced laws. Roj Blake is a revolutionary leader who was captured, had his mind altered so that he betrayed his associates and recanted publicly, then was mind-wiped again so that he forgot even that. When the series starts, he is a model citizen living in a domed city on Earth (which I assume to be London) with no memory of his past, when he is contacted by rebels. They are betrayed by a Federation double-agent called Dev Tarrant, and troopers massacre everyone at a meeting outside the dome. Blake, who has wandered away to think, escapes with his life, but not his freedom. Charges of child molestation are rigged against him, to ruin his reputation and ensure he did not become a martyr, and he is sent to the penal colony of Cygnus Alpha, a place no one has ever come back from. In the holding cells before departure, he meets Jenna, a tough smuggler who prefers to call herself a free trader, and Vila, a nervous thief with an aversion to personal violence (especially when the person is him). On the prison transport ship London, Blake gets a group together to take over the ship. This group also includes Gan, a gentle giant who killed the Federation guard who killed his woman, and Avon, a computer expert who was arrested for a major embezzlement. They get their chance to escape when they encounter a space battle, but after their attempt fails, Blake, Avon and Jenna are sent to investigate a drifting alien ship, and manage to get away in it. They follow the London to Cygnus Alpha and rescue Gan and Vila. The ship is the immensely powerful and fast Liberator, as Jenna names it, and Blake sees it as the means to strike back at the Federation. On their first mission, to blow up a communications plant, they acquire another crew member, an alien telepath called Cally, who is the last survivor of a guerrilla force. This brings the crew to six people—seven, counting Zen, the ship’s computer. Later they get a powerful second computer, Orac, who has the ability to read any computer in the galaxy which has tarial cells, which most do. Orac has a difficult and curmudgeonly personality, based on that of his inventor. Blake’s 7 was not squeamish about killing off its major characters. Gan dies during season 2, Blake and Jenna leave at the end of that season, Cally dies at the beginning of season 4, and in the final episode, an end-of-season cliff-hanger which was never followed by the planned season 5, all of the crew were seen to fall during the final shootout. It was intended that Avon and Vila would survive for season 5 or a spin-off series, and any of the rest but Blake could also survive if the actors wanted to come back. As for Blake, Gareth Thomas, who played him, had it written into his contract that he was killed on screen in the last episode of season 4. Sadly, the series was never renewed. Like so many fans, I was unable to leave it there, and was driven to write a future for these people I had come to like so much, especially my favourite, the very human Vila. The dissident Blake is arrested and sent to the penal colony of Cygnus Alpha, with the thief Vila, the smuggler Jenna, the embezzler Avon, and the 'murderer' Gan who killed the Federation guard who killed his woman. With Avon and Jenna, Blake succeeds in escaping on an alien ship they call the Liberator, and they later rescue Vila and Gan from Cygnus Alpha. Blake decides to use the powerful ship and his crew of escaped convicts against the Federation. On their first mission they meet an Auron guerrilla fighter called Cally who joins them. They strike repeated blows against Federation installations, and effect some rescues of other rebels and exiles. At the end of the season, they acquire the supercomputer Orac who predicts the imminent destruction of the Liberator. The Liberator is captured by the aliens to whom she originally belonged, and during the crew's escape, the Liberator's sister ship is destroyed, thus fulfilling the prophetic image Orac showed them. They continue with their fight against the Federation, interrupted occasionally by other adventures. Blake finally decides to destroy the central computer control for the Federation to bring it down despite the potential enormous loss of citizen's lives, and presses ahead with this dangerous plan despite his promise to the crew to pull out if things go wrong, which they do from the start. Vila breaks into the installation, but they find it to be an empty shell—control was moved to 'Star One', a secret location 30 years before. Gan dies during the escape, holding up a blast door for the others to pass through. After pursuing clues, Blake finds Star One at the end of the season, only to encounter an invasion force from Andromeda, the nearest galaxy. The season ends with the Liberator calling for help from the Federation's space fleet, and about to face the attack alone. Blake promises that should they survive, he will leave and continue the fight on Earth, and let Avon have the Liberator. They succeed in holding off the alien attack until the Federation's space fleet's arrival, and the Andromedans are defeated, but in the process, Star One is destroyed, the Liberator is damaged and the crew have to evacuate. Blake and Jenna have already left; the rest escape in life pods. Avon is the first to return, bringing Dayna with him from the planet Sarran on which he landed, only to find his ship has been taken by Federation troops. One of them however is Tarrant, a deserter-turned-mercenary, and after they kill the troops and rescue Vila and Cally just as they are about to be killed on Chenga as involuntary organ donors, he joins the crew as their pilot. Tarrant takes command at first, and after an early failed attempt to establish a base and find allies, they seem to drift aimlessly around the galaxy responding to outside threats but initiating little action of their own. After a struggle for command, Avon ends up with control, but unlike Blake he is not a natural leader and has no aim or cause. He hears that Blake is on Terminal and without telling the crew what he is doing, flies there through an enzyme cloud which begins to attack the Liberator and ultimately destroy it. The news is a trap set by President Servalan, their old adversary, who says that Blake is dead and takes over the dying Liberator while Vila cleverly escapes with Orac. The season ends with the crew marooned on Terminal with Servalan's damaged ship, watching the Liberator blow up with Servalan apparently on board. The series was meant to end here with the destruction of the Liberator and presumably Servalan, but with the crew's future left open. I think it's a pity it didn't happen. 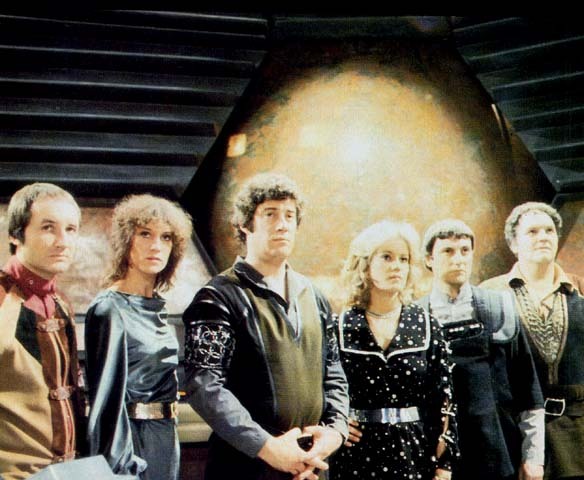 As the credits rolled, the BBC announced that Blake's 7 would be back, even though the cast hadn't even been informed. The ship Servalan left was booby-trapped with explosives, as was the base. Vila rescues Tarrant from the base, and tries to go back for Cally, but she dies, as he hears telepathically. The survivors are rescued by Dorian, a salvage operator who takes them back to his base on Xenon with the plan of using their life-forces to extend his already centuries-long life. (One assumes he named himself for the Oscar Wilde character.) With Vila's help, Avon kills Dorian, and his companion, a gunfighter called Soolin, joins them. Dorian's base and his ship, a beaten-up old scow, becomes theirs. Avon installs a teleport (Dorian had been working on one) and they soon acquire a very fast stardrive. At this point, Avon becomes the rebel he hasn't been up till now, but everything they attempt ends in failure. Avon has become even colder and more unfeeling, Vila sinks into depression, and the whole season is a downward spiral to the end, the infamous final episode where Avon finally finds Blake again only to think he's betrayed them. Avon guns the unarmed man down, killing him. Vila shows a flash of bravery when he, 'harmless and armless', disables the Federation officer Arlen who has just shot Dayna, only to fall himself. As troopers enter the room, we see the rest of the crew fall one by one. This was the opposite case to the ending of season 3—it was intended as a cliff-hanger for a season 5 which never happened. The writer Chris Boucher said that any character but Blake could return. No blood was shown on anyone but Blake (were the troopers' guns set to stun? ), and the scene was filmed in slow-motion to give it a dream-like look in case it was a drug-induced hallucination. The creator, Terry Nation, was apparently upset at what happened to 'his characters' and hoped that if a 5th season was not made, a new series with at least Avon and Vila would be, but sadly that wasn't to be either.